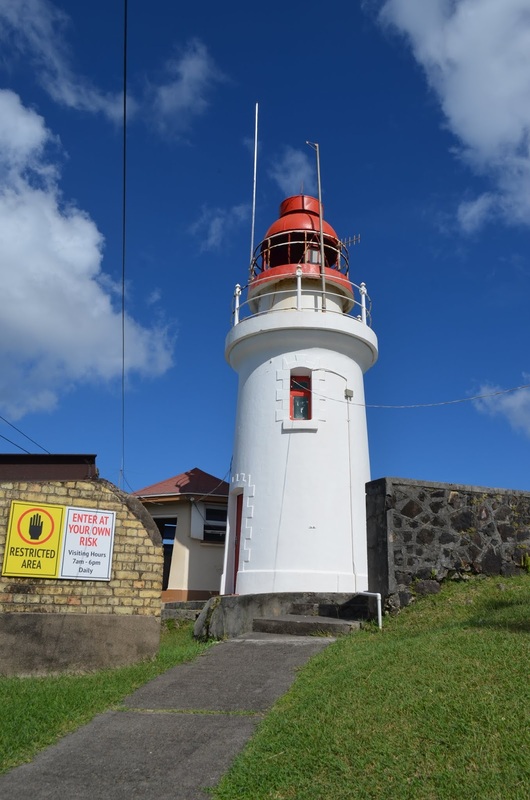 The Vigie Lighthouse is located atop a hill on the Vigie Peninsula just north of the main harbour area of Castries, St. Lucia. A station was established at this point in 1883 and the current lighthouse dates to 1914. 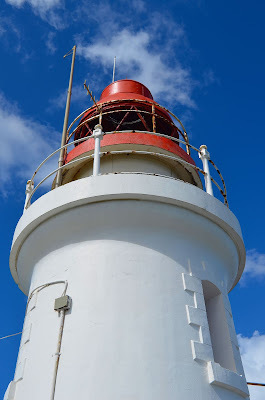 The light is an 11 metre cylindrical tower with gallery and is white with red trim. While they keep the lighthouse painted, it is not in great condition with all the glass missing from the gallery. Light is active. A small house adjacent to the lighthouse is used for communications for the port authority. Photos were taken in November 2019. 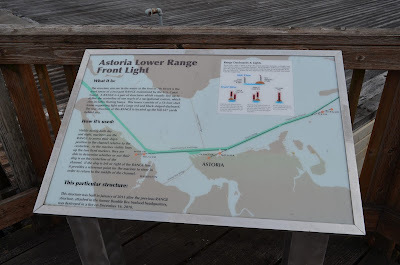 The Astoria Lower Range Front Light is located on the riverfront of the Columbia River in Astoria, Oregon just East of the Astoria-Megler Bridge. 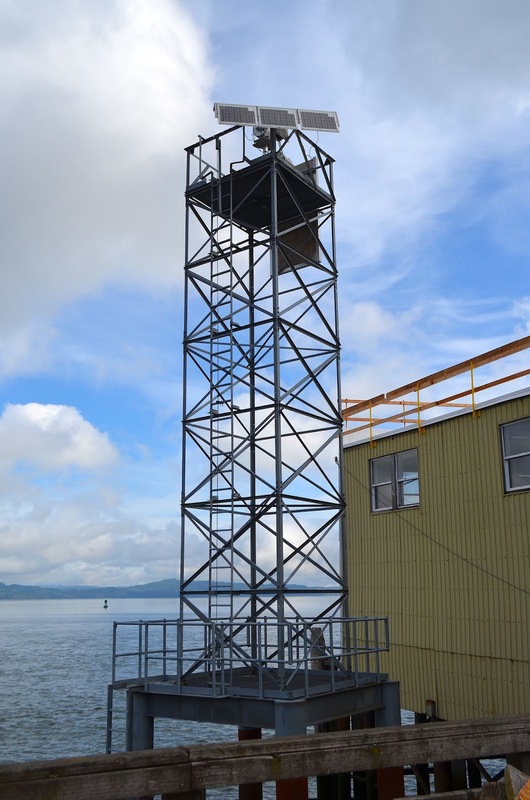 It is a metal skeletal tower with a beacon on a concrete piling base. The current light was constructed in 2011 to replace a former light that was destroyed by fire. Photos taken in September 2018. 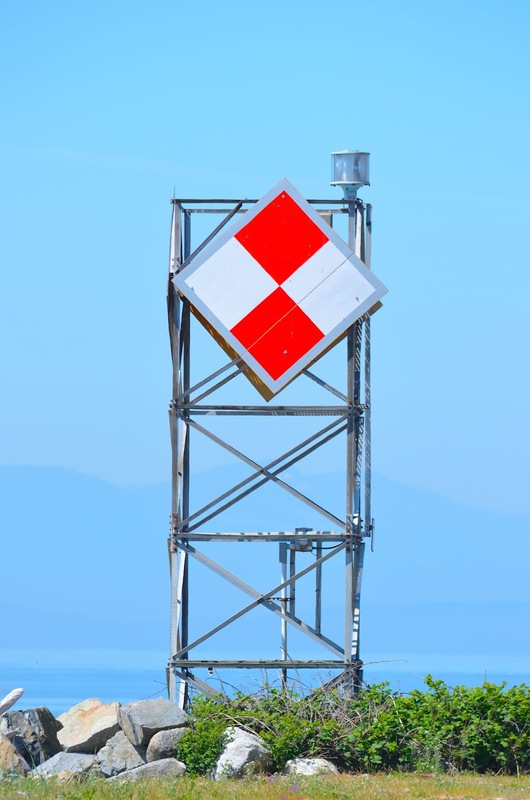 This aid to navigation is located in Lighthouse Marine Park, Point Roberts, Washington. It is 25 foot tall skeletal tower with a beacon and diamond shaped daymarker. It is at the southwest point of Point Roberts which is a point of land in the US that juts out from Canada at Tsawwassen, B.C. It is part of Whatcom County, Washington, although is detached from the main part of the county and one must enter Canada and then reenter the US to access it. 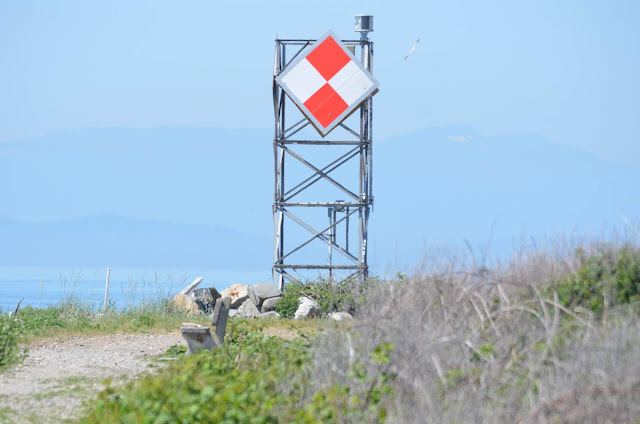 A society is working with the US Coast Guard to build a proper lighthouse on this site. Photos taken in May 2018. The Tabusintac Lighthouse is a faux lighthouse that is found in Tabusintac, New Brunswick on the Southwest side of the Tabusintac River Estuary near the Gulf of Saint Lawrence. 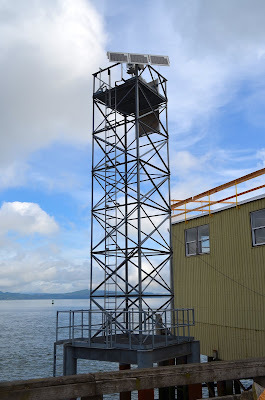 It functions as an interpretive centre for the area and visitors can climb the tower to view the estuary. Date of construction is not known. While there was once an actual light in the Tabusintac area in the early 1900's known as the Tabusintac Gully Lighthouse, it is not known if this faux light is close to the location of the original lighthouse. Photos taken in October 2017. Although there was an actual lighthouse in Grande-Anse, New Brunswick in the early 1900's, the current building is only a faux lighthouse. It sits on a bluff in the village of Grande-Anse on the South side of Chaleur Bay. The current building functions as a tourist information centre for the area. It was constructed sometime in the 1990's and in 2001 was painted the colours of the Acadian flag. Photos taken in October 2017. The Inch Arran Rear Range Light sits on a bluff just to the West of the Inch Arran Point Front Range Lighthouse in Dalhousie, New Brunswick. This light was established in 1972. The light is a 10 metre skeletal tower. Photos Taken in October 2017. The Inch Arran Point Range Front Lighthouse is located on a point of land at the Northeast corner of the Province of New Brunswick in the town of Dalhousie. The point of land is on Chaleur Bay just to the East of the mouth of the Restigouch River. The light is an 11 metre tall wood tower with gallery. 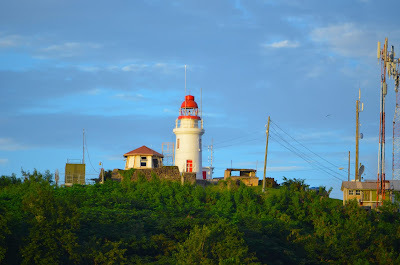 Date of construction is not certain, but there has been a light station at this point since 1870 and this lighthouse is believed to have been first constructed around that time. 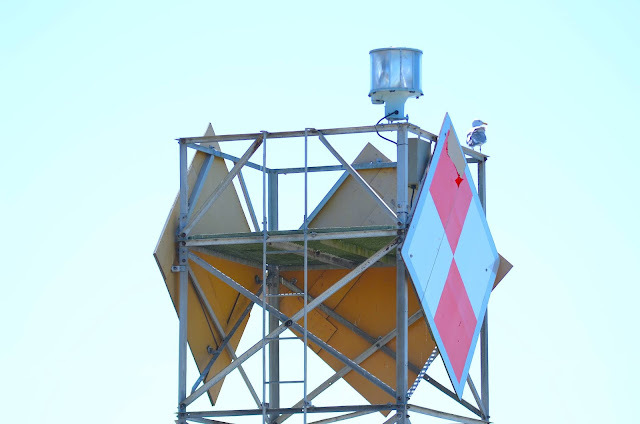 Up until 1972 this was an independent light, however in 1972 a second light was established to the West of this location and this light became the Range Front Lighthouse. My photos unfortunately do not show the vertical red strip that is on the water side of the lighthouse. 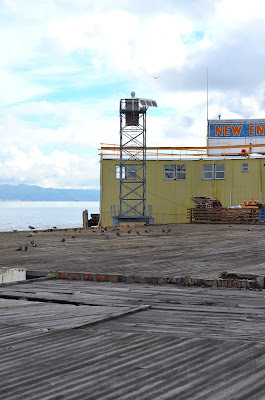 When I was at the site, I noted that the city is currently improving the area around the lighthouse and appears to be constructing a large sundial in front of the lighthouse entrance. Photos taken in October 2017. The Campbelton Rear Range Lighthouse is located in the town of Campbelton, New Brunswick, on the shore of Chaleur Bay. It sits East of the Van Horn Bridge that links New Brunswick to the Gaspe region of Quebec. 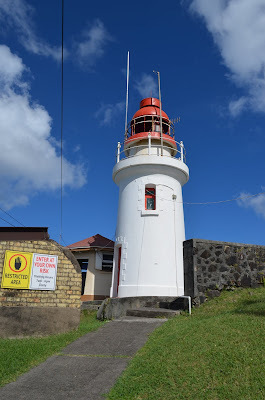 A light was established at this location in 1879, however the current lighthouse dates to 1985 when the current building was built around the then existing steel skeletal tower. The light was deactivated for a time commencing in 2013 but has since been reactivated. The structure is a 15 1/2 metre tall wooden tower surrounding the steel skeletal tower. A 1 1/2 story building is attached to the tower and it serves as a youth hostel. Photos taken in October 2017. The current Carleton Lighthouse is a 1994 replica of the original light which was built in 1911. 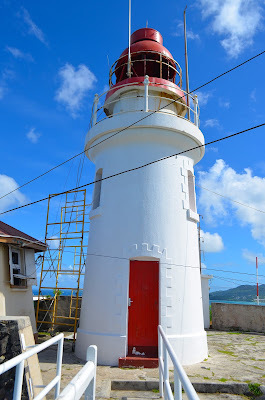 The original light was destroyed by fire in 1970 and the local citizens had a replica built in 1994. The light, an 8 metre tall wooden structure, is not active. It is located on Pointe Tragadigache on Chaleur Bay just east of the town of Charleton-sur-Mer, Quebec on the South of the Gaspe Peninsula. The area surrounding the light has park and trails and is a great spot of walking or birdwatching. Photos were taken in October 2017. The current Pointe Duthie Lighthouse sits on a bluff of land on Chaleur Bay just West of the town of New Richmond, Quebec. The original lighthouse was only in operation from 1903 to 1914. At that time it was dismantled and moved to a nearby farm. The light is a 10 metre tall wooden tower. Part of the lighthouse was destroyed by fire and the remainder used as a storage shed. In 1989 the remaining portions of the lighthouse were used to reconstruct the current light. It is part of the Gaspésian British Heritage Centre and accessible by a 2 1/2 kilometre walk from the parking lot. In season there are horse drawn carts available to get to the area. The centre has a number of interesting period houses and businesses to view. Photos taken in October 2017. The Pointe Bonaventure Lighthouse sits on the West side of the Bonaventure River where it empties into Chaleur Bay in the South part of the Gaspe Peninsula. It is just East of the Town of Bonaventure, Quebec. The light, which dates to 1902 was originally at Pointe Échouerie and then moved to Pointe Bonaventure in 1907. The light was relocated to its current location in 2005. The light has been inactive since 1998 and is currently on the private property of a campground alongside the river, although access to the site is open. the light is a 7 1/2 metre tall wooden tower with gallery. Photos were taken in October 2017. The Cap d'Espoir Lighthouse is located on a point of land approximately 10 kilometres Southwest of the town of Percé on the Gaspe Peninsula of Quebec on the Gulf of Saint Lawrence. The light, dating to 1939, is active and consists of a 14 metre tall concrete tower with gallery. There are two houses adjacent, one which was the former light keeper's house. These houses are available for vacation rental. There is also a utility shed directly adjacent to the tower. The site is privately owned. Photos taken in October 2017. The Cap Blanc Lighthouse is located on a point of land just West of the town of Percé on the Gaspe Peninsula of Quebec on the Gulf of Saint Lawrence. It dates to 1915 and has been inactive since the mid to late 1990's. The light is a 7 metre tall concrete tower. Access is by walking through a local campsite and one should ask permission before entering the area. Photos taken in October 2017. The Cap-des-Rosiers Lighthouse is located on a point of land just Southeast of the village of Cap-des-Rosiers on the Gaspe Peninsula of Quebec. The closest larger centre is the town of Gaspe to the West around a long inlet. The light, dating to 1858, is a 34 metre tall round limestone tower with gallery. It is the tallest lighthouse in Canada and one of the few stone towers found in Atlantic Canada. The light is active and managed by the Cap-des-Rosiers Lighthouse Historic Site Committee in conjunction with Fisheries and Oceans Canada. It is classified as a Federal Heritage Building. Although it is a historic site and draws thousands of tourists each year, the fate of the light, which requires extensive repair, remains in limbo as of my visit in 2017. Photos taken in October 2017. The Pointe-à- la-Renommée Lighthouse is located on a cliff at the end of a point of land overlooking the Saint Lawrence in the Gaspe region of Quebec. It is at a location where the Gulf of Saint Lawrence begins to narrow to become the Saint Lawrence River. The Lighthouse is found 5 kilometres to the West of the village of L'Anse à Valleau. The site is also the site of an early Marconi (radio) station dating to 1904. 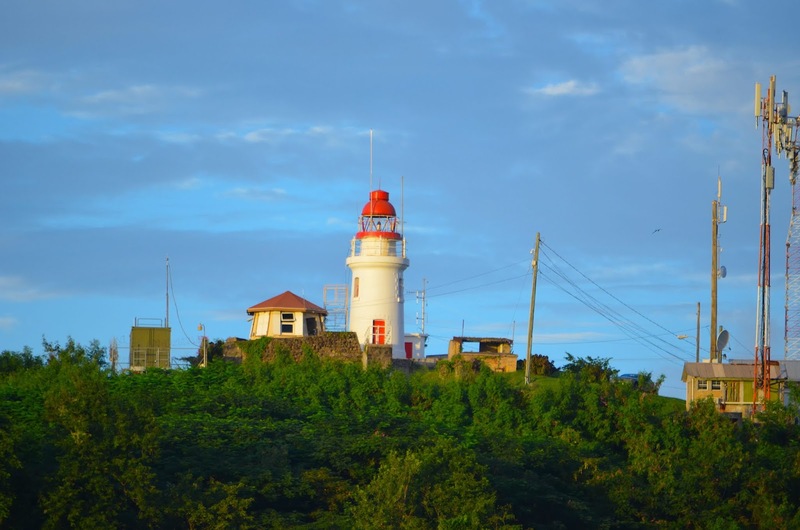 The lighthouse itself dates to 1907 and has been inactive since 1975. In 1977 it was dismantled and removed and later reassembled in Quebec City near the Coast Guard Station. It was returned to its original site at Pointe-à- la-Renommée in 1997. The light consists of a 15 metre round cast iron tower and adjacent keepers house. the Marconi station is located directly to the West of the tower. It is open to the public in season however when I visited in early October 2017 only the grounds were open. Photos taken in October 2017.